Late last week St. Petersburg councilors made a step forward for the Rowdies’ MLS expansion scheme. Approving the ordinance language is the first step in a process that, if successful, would lead to a May 2 referendum that would allow St. Petersburg residents to vote on giving City Council the authority to negotiate a long-term use agreement for Al Lang Stadium. 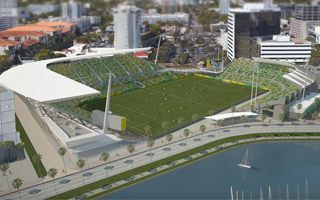 According to a press release issued by the Rowdies on Thursday, the use agreement would not be able to exceed 25 years and would allow Al Lang Stadium’s primary purpose to be as the home field for a potential MLS team. The 2nd-league club Tampa Bay Rowdies proposed expanding their stadium in a bid to join MLS as a future expansion side. Instead of the old capacity of 7,500 Al Lang Stadium in Staint Petersburg should reach 18,000, as required by the league authorities. The project is expected to be worth $80 million. Full cost of the renovations would be financed entirely by team owner Bill Edwards and the upgrades would only happen if Tampa Bay is awarded an MLS expansion team.